On the third day, the Goddess is dressed in the color White while devotees wear the color Grey. On the fourth day, Red is the color for the Goddess as it symbolizes that the Goddess is the creator of the universe. The devotees wear the color Orange on this day. On the fifth day, the Goddess is dressed in the color Blue, while the devotees wear White. 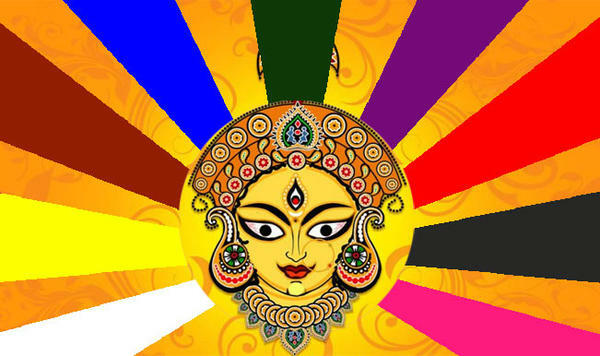 On the sixth day of Navratras, devotees wear the color Red and the Goddess wears the color Yellow. Proceeding to the seventh day, the Goddess protects her devotees from evil and hence wears the colour Green while her devotees wear the color Blue. The eighth day is the day which is most awaited by female devotees, since that is the day when they get to wear the color Pink. On this day, the Goddess wears Peacock Green. It is the ninth day which marks the culmination of the festival and on this day the Goddess and devotees wear one and the same color - Purple. This is the day when the Maha Navami puja is done and this year the Maha Navami and Dassera fall on the same day - Oct 3. Happy Navratras! Who Got Ash This Gold Dress?